Well, our Fall Chesapeake cruise was cut short as the high temperatures went from the mid- eighties to the unseasonable low sixties, literally overnight. We hoped to cross to the eastern shore at Annapolis and explore Mitchner’s Chesapeake setting of St. Michaels, Oxford, Cambridge, the Choptank River, and etc. but it wasn’t to be in 2018. Stay tuned for that adventure in the Spring! A candle, warm sweater, hot cup of coffee and Kathy Hall’s book to keep me warm on a cold morning. When the low temps dipped into the thirties and we learned that there weren’t grocery stores open on the eastern shore, we decided to eat up the food we had onboard and head home. Another deciding factor was that our intended winter storage marina, Herrington Harbor (see previous posts), was starting to get busy (1,000+ annual haul outs) and we didn’t wish to live aboard while on a non-predictable waiting list. Thus, we signed a contract and hustled ourselves and the Namaste southward once again for a safe winter harborage. The lovely Herrington Harbor Marina in Tracy’s Landing, MD. Side note: at 5:45 on Friday afternoon a small army of workers armed with large black garbage bags covered every inch of this huge marina, boat works and storage yard collecting all traces of litter. The place is immaculate and not something you find in many marinas. We love this place! A sense of the peacefulness in this lovely spot! 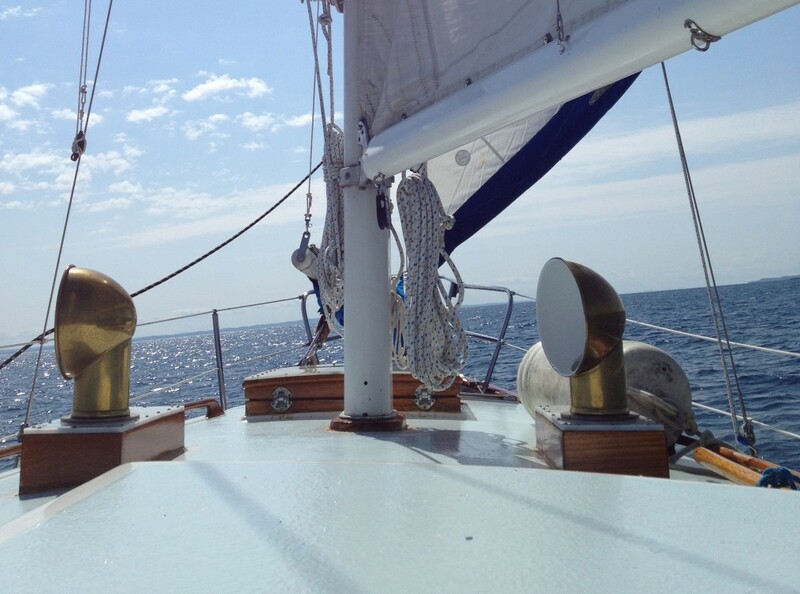 It was a pretty trip out of Annapolis and down the western shore but cold at the helm with a high temp of 62. I spent time down below out of the wind and enjoying the heat of the engine but Jim and Sammy reported bone chilling cold, reinforcing our homeward bound decision as we pulled into the welcoming slip. The sky on our trek out of Annapolis. Time to go home! Fish nets coming down the shore reminding us of why we never travel at night. An issue with traveling by boat is always, where was it that we left the car? This time we had left her at the Deltaville Marina which, although not that far by boat was a 180 mile retrieval trip. We always look for other options but this time we used our Looper’s discount at Enterprise and rented a car for the six-hour round trip. Upon our arrival back at the marina, the Namaste was sitting pretty on the hard (meaning ground), as they say. Our final boat puzzle for the 2018 season was figuring out her winterizing procedure. After 17 years, Jim had mastered the process for our Namaste sailboat but this was a new animal: adding a generator, two heads, and a heating/air-conditioning system. Crawling around on hands and knees in small spaces along with several trips to West Marine as well as consultation with Dan were involved. The Captain worked through each system step-by-step with me taking copious notes turned check-list for years to come – hopefully we didn’t forget anything important. Always nice to have an engineer-captain! Twelve gallons of pink anti-freeze (sometimes erroneously tagged red-pop) was carried up the ladder and poured into the appropriate spots to protect the Namaste’s important systems. On Saturday, October 20, exactly four weeks after we left Michigan, we turned the car around and headed northwest and home. Always a bittersweet day. We look forward to catching up with family and friends as well as a slower/quieter/colder pace for the next few months until we return to complete our Chesapeake cruise and likely our Loop on Lake Charlevoix in 2019. Have a great winter! As we left, I snapped an early morning vista of the marina and beyond to the Chesapeake Bay. Get Well Soon: Delighted to report that Dwain is out of the woods and making good progress after 36 days in intensive care. Progress Report: The young family sailing to the Bahamas that I mentioned two blogs ago is now in Oriental, NC. After some challenging weather and skinny water they are happy and safe. Thank You to: Kenny for his helpful Chamber of Commerce Chesapeake info and to Ev and Clark for their generous invitation to join them on Sunset Delight this winter in Marathon!